If you already enjoy a regular cup of coffee in the mornings, we have good news for you. 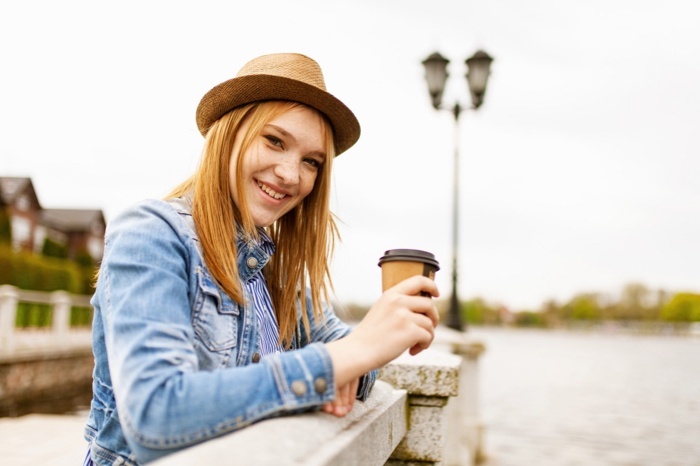 According to a recent study, drinking coffee is good for the skin! We give you all the details below, plus some tips on how you can use coffee topically for more skin care benefits. The news came out just a few months ago—those who drink more caffeine, particularly from coffee, are less likely to develop rosacea. Rosacea is a chronic condition that affects the face. It can develop at any age, but typically starts after the age of 30. Symptoms include flushing and redness on the cheeks, nose, chin, and forehead. These symptoms tend to come and go, flaring up worse at certain times and in response to certain triggers, and then fading again. Over the years, rosacea can get worse, with the redness becoming darker and more persistent, and blood vessels starting to become more visible. Without treatment, red bumps and pimples may also develop, and the nose may grow swollen and bumpy. In about half of those with rosacea, the eyes may also feel irritated and look watery or bloodshot. Perhaps the worst part of rosacea is the effect it can have on the sufferer’s self-esteem. According to surveys from the National Rosacea Society (NRS), about 90 percent of rosacea patients stated the condition had lowered their self-confidence and self-esteem, and 41 percent reported it had caused them to avoid social outings or even cancel social engagements. More specifically, those who consumed the most coffee (four or more servings a day) had a 24 percent lower risk of rosacea than those who consumed the least (less than one serving per month). The study results were interesting because, as most rosacea patients know, dermatologists usually advise against hot beverages, believing them to exacerbate symptoms. The study authors “makes us question what we’ve been telling patients for years, and the fact that we might not need to include caffeinated coffee in that list anymore,” Noelani Gonzalez, M.D., of Mount Sinai West in New York City told MedPage Today. Why would coffee help? Caffeine is a known vasoconstrictor, which means it shrinks blood vessels, which could help reduce the flushing and redness seen in rosacea. It also has healthy antioxidants that can protect skin from free radical damage. It could be, however, that other healthy compounds in coffee are responsible for lowering the risk of rosacea—scientists aren’t sure yet. Meanwhile, if you don’t have rosacea and you already drink coffee, it may help you avoid developing the condition. If you do have rosacea and you’ve been avoiding coffee, you may be able to add it back to your daily diet. Just go slow, try one cup at a time, and see how it affects you. In addition to this new research, we also have other evidence that coffee can be beneficial to your skin’s health in many ways. It’s a good source of antioxidants: Antioxidants, from any source, are powerful anti-aging elements for skin, and can help protect from the damaging effects of pollution, stress, and poor diet. Helps relieve under-eye puffiness: If you wake up with puffy eyes, try a coffee-infused eye cream, as the caffeine will help take down the swelling. You can also make your own by mixing 2 teaspoons of coffee grounds with one egg white. Beat together until frothy, then apply the mask around and under the eyes. Let it dry for about 10 minutes, then rinse away. Follow with a moisturizer. Acts as a gentle exfoliator: If you have sensitive skin, you can use coffee grounds in a homemade formula to make a gentle exfoliating scrub. Simply mix the grounds with some coconut oil, almond oil, olive oil, heavy cream, or yogurt, and then apply a light coat to your face and scrub gently. You can add some honey if you like for additional moisturizing and antimicrobial properties. Let sit for about 15 minutes, then rinse away. May help reduce cellulite: The caffeine in the coffee may help to reduce the appearance of cellulite. Use the coffee scrub you made in step three on the affected area, then rinse away. Protects from the sun: Applying coffee to the skin can help decrease the appearance of redness and sun spots. Drinking it may also help reduce the damaging effects of the sun. In a 2015 study, researchers found that those who drank more coffee had fewer pigmented spots on their skin than those who drank less. Helps reduce acne flare-ups: Coffee has anti-inflammatory and anti-bacterial benefits, which can help cut down on acne breakouts. Combine that with the natural exfoliating action of coffee grounds, and you could have an effective acne treatment. Try a twice-weekly mask made up of coffee grounds, yogurt, turmeric, and honey. Softens heels: Coffee grounds can help brush away dead skin cells on the heels and soles of the feet and can also help leave the foot feeling softer. To use it in a foot bath, add some brewed coffee and coffee grounds to a bucket or tub, allow it to cool, then soak the feet, using a soft skin brush and the coffee grounds to scrub away the dead skin cells. Follow with a rich moisturizer like our Body Repair Lotion. Do you use coffee in your skin care routine?